Emerging district, Pearl in San Antonio, is adding to its coterie of cool with a roster of restaurants, bars and shops, that are redefining an area that was once home to the city’s industrial hub. New York-based design firm Roman and William’s have added extra kudos to this mix, taking on the colossal revamp of the 19th-Century Pearl Brewery by architect August Maritzen. 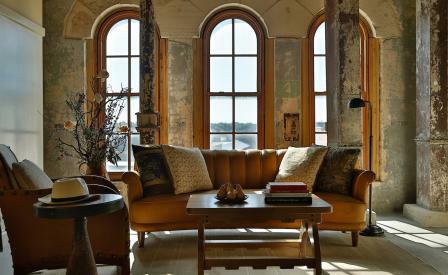 The duo, whose previous projects include the Ace, Viceroy and Highline hotels in New York have proved that they do sympathetic restoration well, and the 143-roomed Hotel Emma named in homage to the brewery owner’s wife and San Antonio darling Emma Koehler, with its locavore culinary offerings and clubby bar further exemplify this. Rooms in the brewhouse tower feature chipped plaster walls kept fresh with hand-crafted white oak and caramel leather sofas strewn with rough natural linens but our pick has to be the Terrace Room, replete with an 86sq ft Redondo-tiled balcony and custom-made mesquite bench, they provide a respite from the bustle of the city down below, looking out across leafy River Walk. Despite sporting a dramatic 25-foot vaulted ceiling the Sternewirth bar, named for the traditional brewery ‘privilege’ that allowed its employers to drink in taprooms for free, manages to summon a cosy atmosphere, and though there are no gratis suds these days San Antonians flock to swill prohibition-inspired cocktails from the comfort of custom-made beer-tank banquettes.